Playing With Style - Digital DVD addition! We really do live in the video age so we have finally added the Playing With Style DVD to our musical resources! Yeah, it's about time. 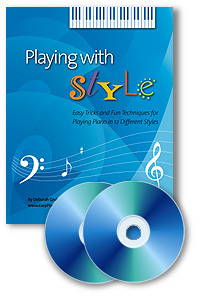 Playing With Style (book and 2 CDs) is 48-page program that teaches you 23 tricks and techniques for playing in 12 different accompaniment styles. Read more here. People have been asking more and more for DVDs in digital form so here it is. We will send you the entire program WITH the DVD for $46 which is 20% off list price. Once you order through this Paypal button (not the website yet), you will receive the links for digital download of the book, CDs and DVD. As promised last week, the next edition of Fills and Frills DVD 202 is being recorded and will available within the month! Be well and I'll talk to you next week. Next week's video lesson will be on playing latin rhythms - Que Bueno! !